Dresser Wayne is a leading manufacturer and supplier of integrated retail solutions to the global petroleum and convenience store industries, supplying retail petroleum fuel dispensers, dispenser control systems, credit/debit card processing terminals, and point-of-sale systems for petroleum markets worldwide. With 400 hourly workers across four buildings in their manufacturing facility coupled with manufacturing costs that are directly affected by the productivity of employees, Wayne needed a more efficient method of collecting time and attendance records and readying the information for payroll. 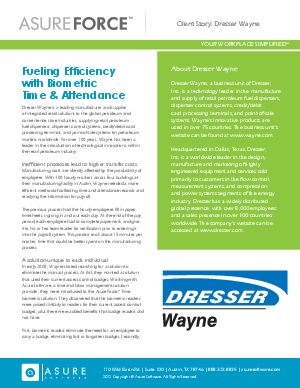 As a solution to the lengthy process of hourly employees manually filling out timesheets each day, Dresser Wayne turned to the AsureForceT Time biometric readers and experienced many of the benefits to the AsureForce Time & Labor Management System very quickly, seeing an annual savings of more than $20,000.